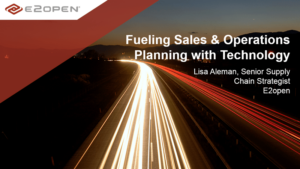 Fueling Sales & Operations Planning with Technology - E2open | Demand. Supply. Delivered. In this webinar, Lisa Aleman, Senior Supply Chain Strategist at E2open, shares why enabling technology is necessary to support a company’s S&OP journey, benefits of supporting the components of S&OP with advanced technology, and key factors to consider as you broaden your solution footprint.